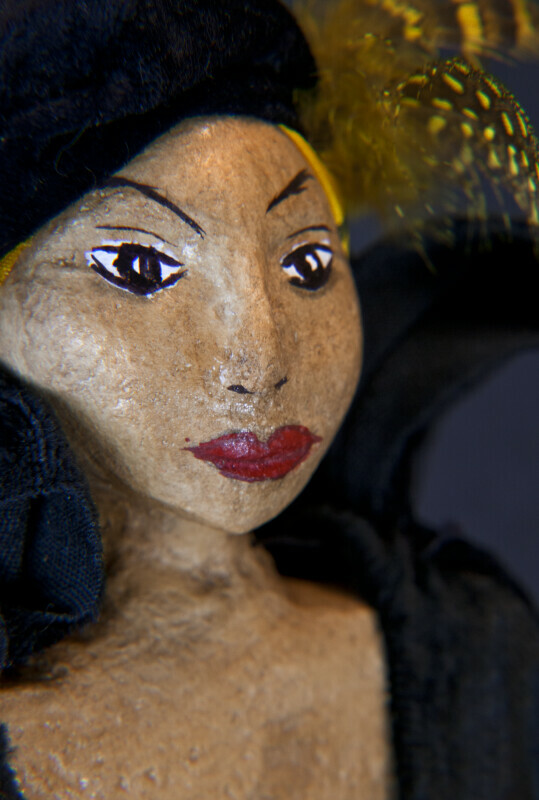 This rod puppet of a woman in Belgium is said to represent a gypsy woman. Belgium, and neighboring European countries, have historically had a strong Roma gypsy population. Her head and bodice are carved from plaster, and she is wearing a velvet coat and hat. Her long black dress has a wide corduroy belt. She has a feather in her hat and a hand painted face. Two long bamboo sticks are attached to her hinged wooden arms to manipulate the puppet. The figure stands 25 inches (64 cm) tall.